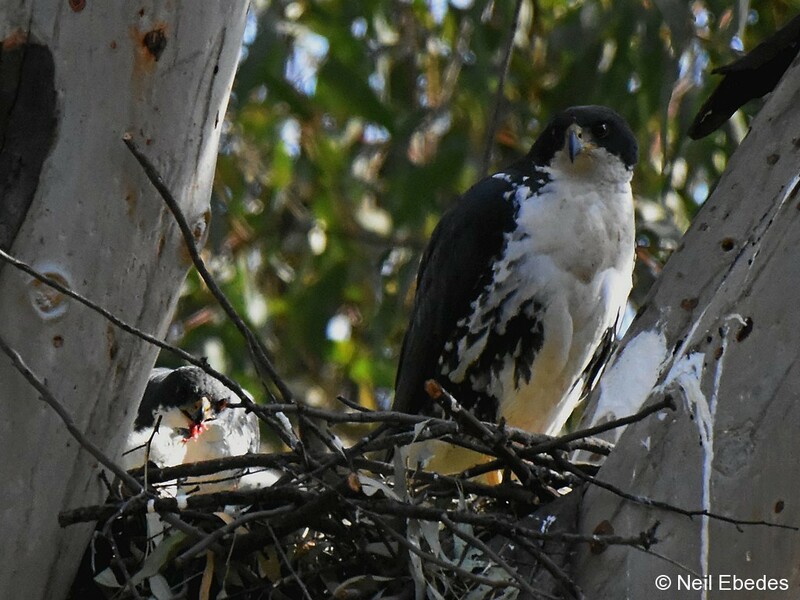 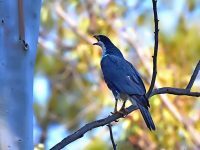 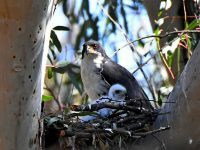 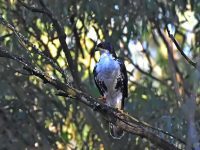 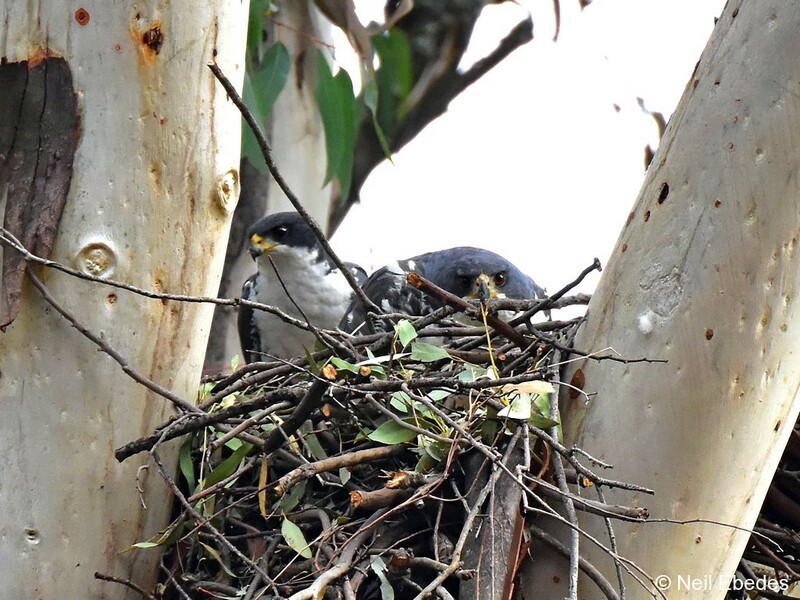 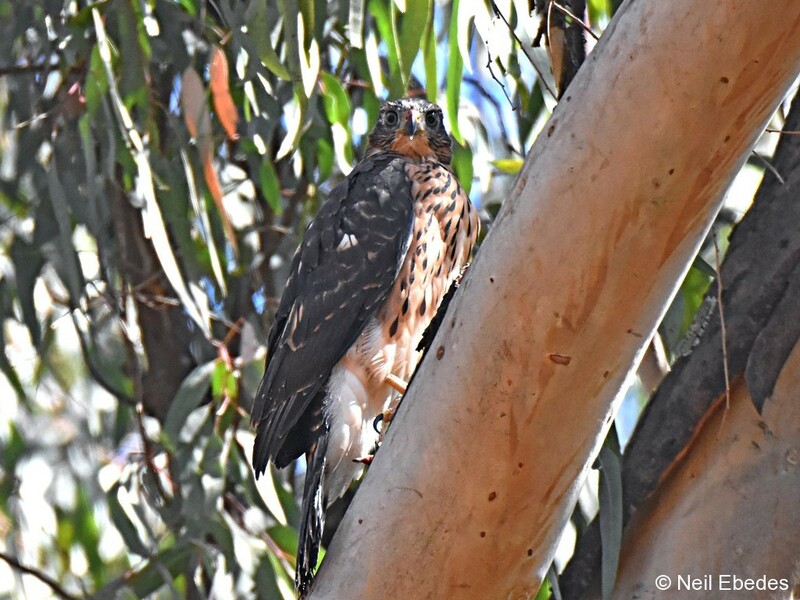 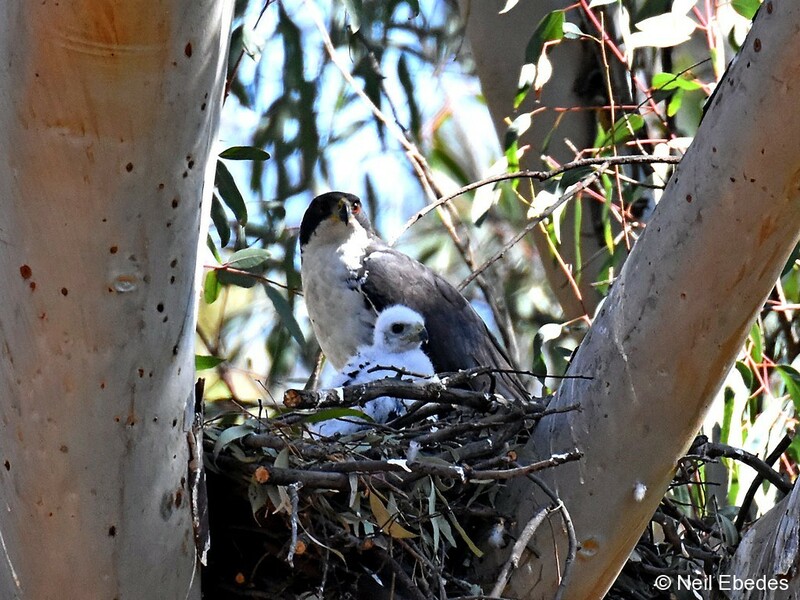 The black sparrowhawk is one of the world’s largest Accipiters, only the Henst’s, Meyer’s and the northern goshawk can match or exceed its size. 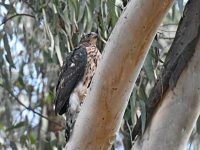 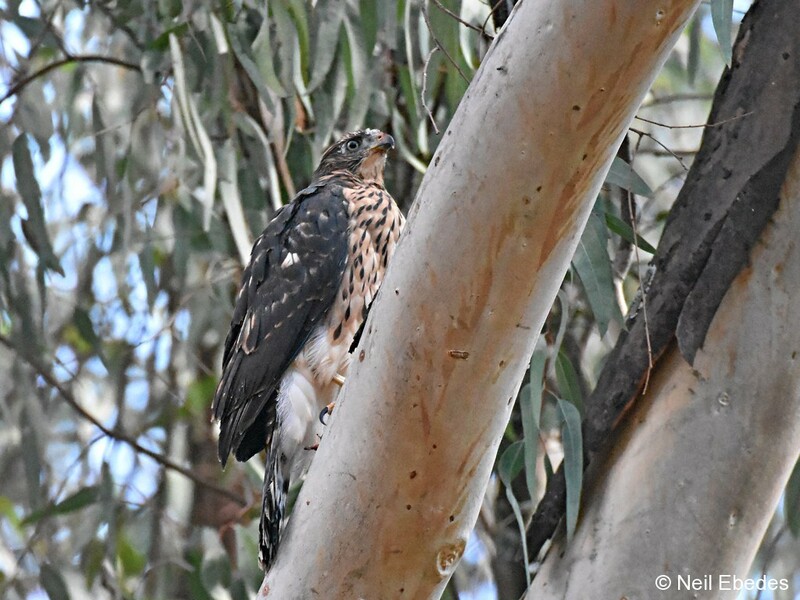 As is common in the genus Accipiter, male black sparrowhawks are smaller than females. 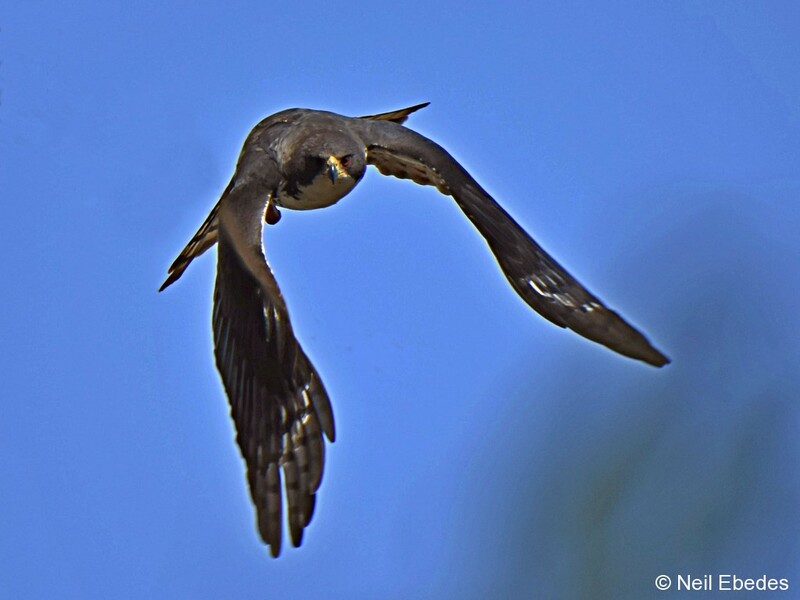 This bird, especially when breeding, is aggressive towards Humans and monkeys. One can get quite close, but ……increase your shutter speed. 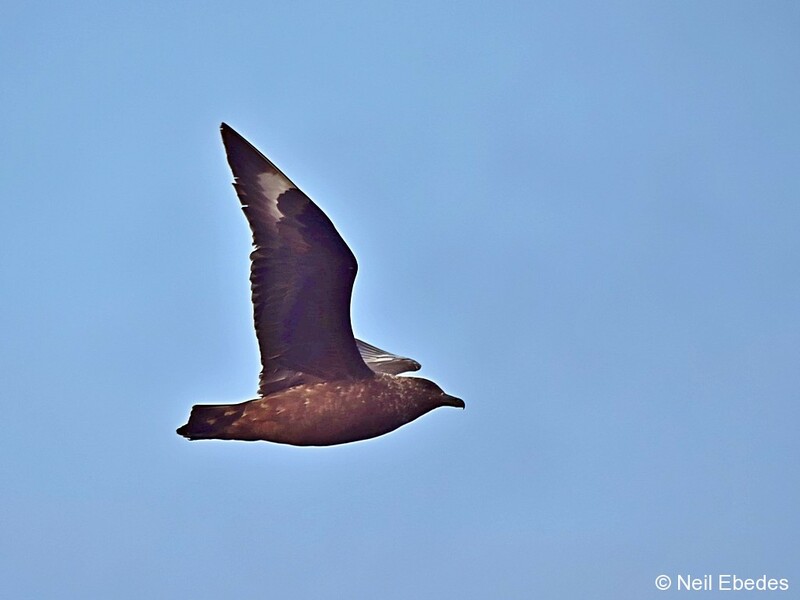 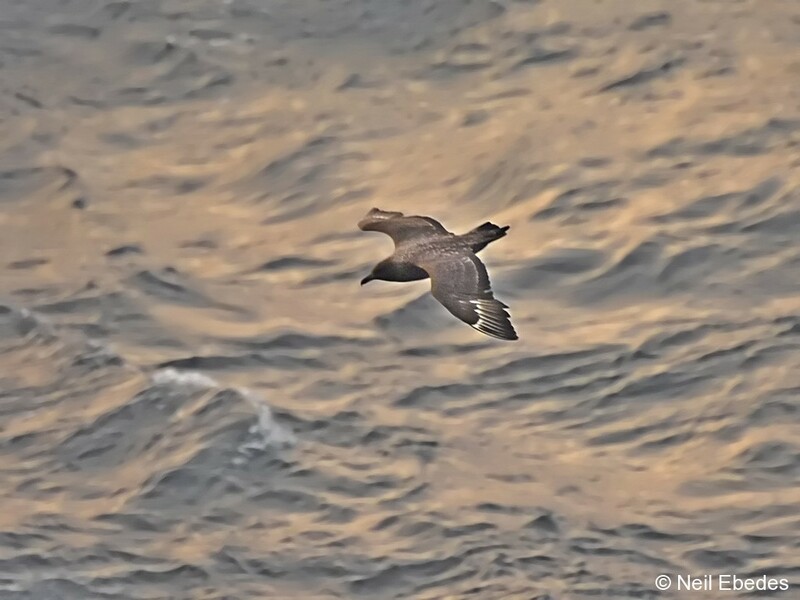 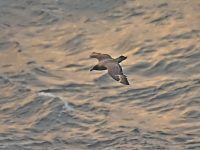 This is the heaviest species of skua and rivals the largest gulls, the great black-backed gull and glaucous gull, as the heaviest species in the shorebird order. 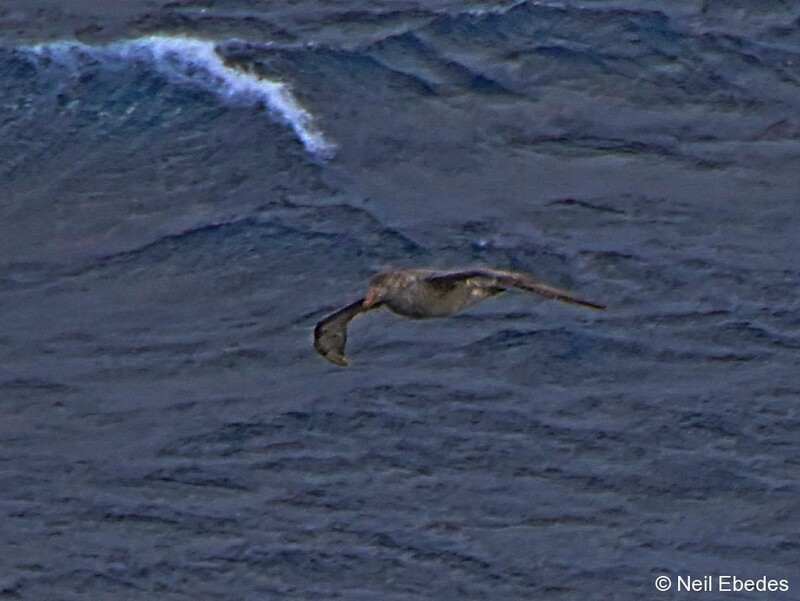 The northern giant petrel along with its counterpart, the southern giant petrel, make up the Macronectes genus. 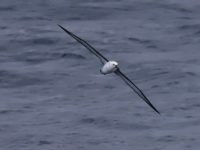 They come from the Procellariiformes order, which are referred to as tube-nosed seabirds, due to their unique nose structure. 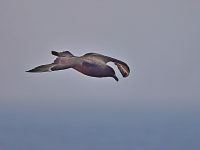 All tube-noses have tubular nostrils, and all Procellariidae have the openings on top of the upper portion of the bill. 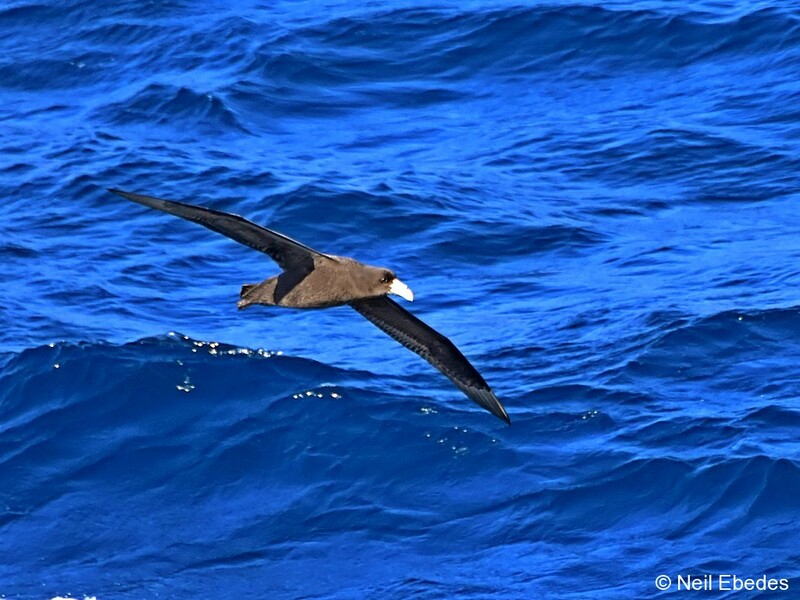 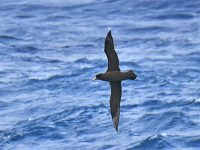 Procellariiformes also have between seven and nine distinct horny plates for their bill, and petrels have one of these plates that form the hooked portion of their upper bill called their maxillary unguis. 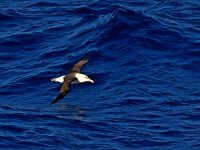 They produce a stomach oil made up of wax esters and triglycerides that is stored in the proventriculus. 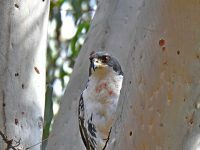 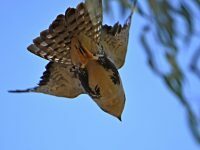 This can be sprayed out of their mouths as a defence against predators as well as an energy rich food source for chicks and for the adults during their long flights. 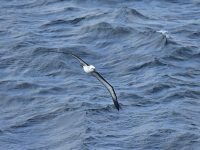 Finally, they also have a salt gland that is situated above the nasal passage and helps desalinate their bodies, due to the high amount of ocean water that they imbibe. 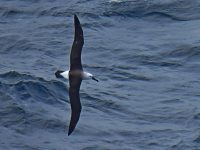 It excretes a concentrated saline solution from their nostrils. 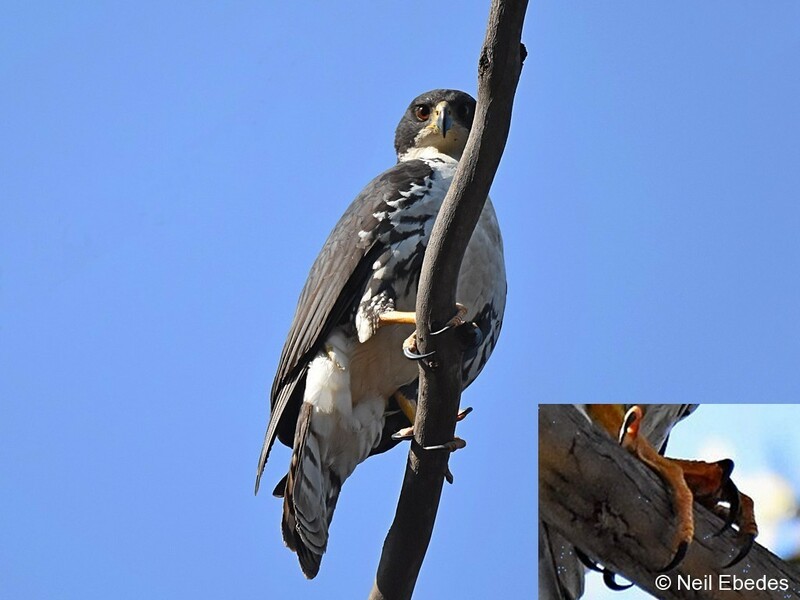 Near threatened in Namibia and South Africa. 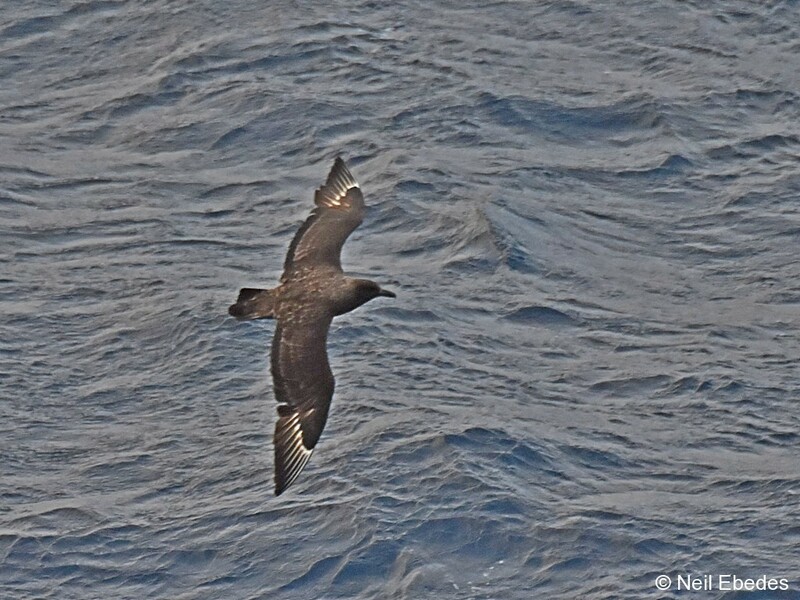 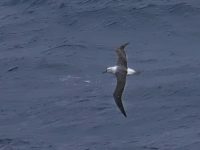 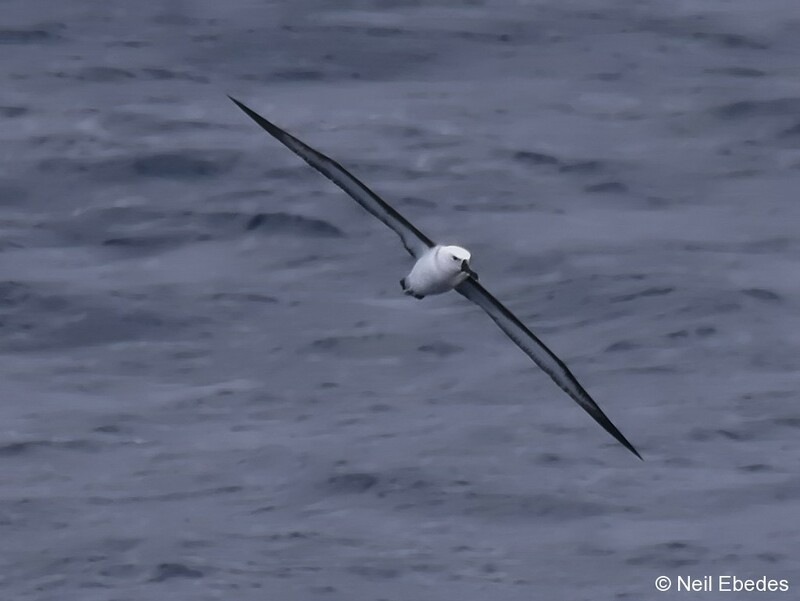 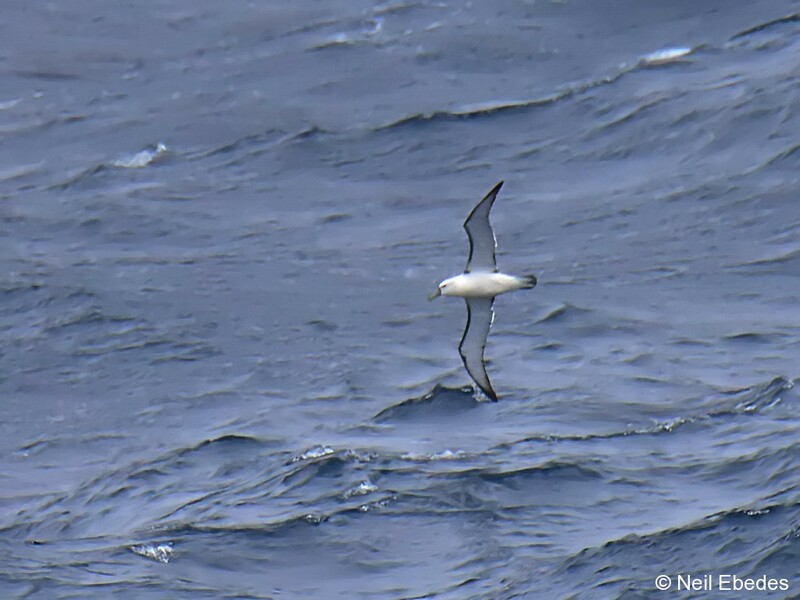 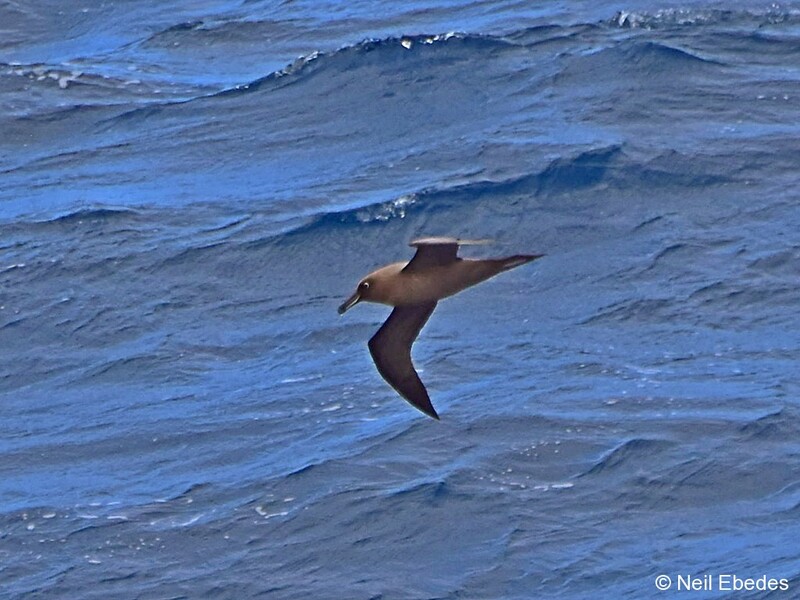 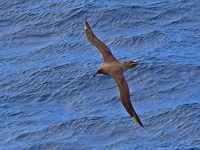 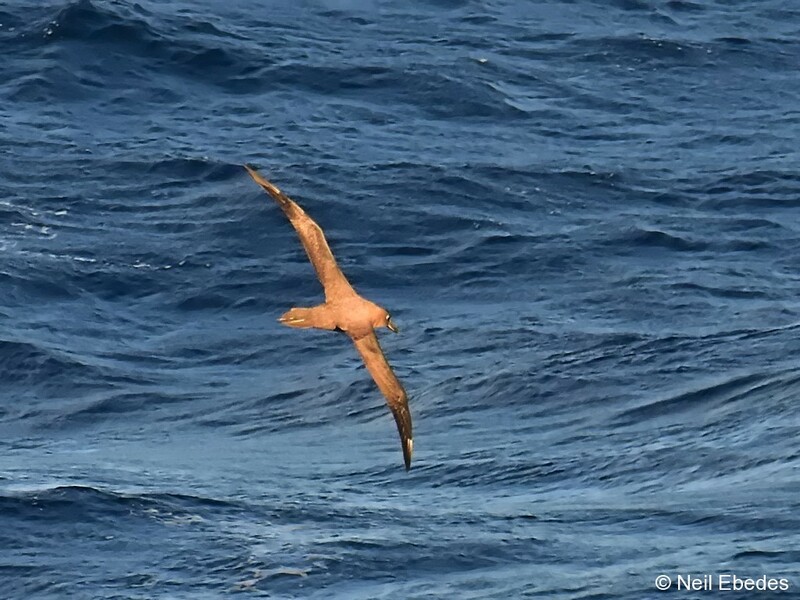 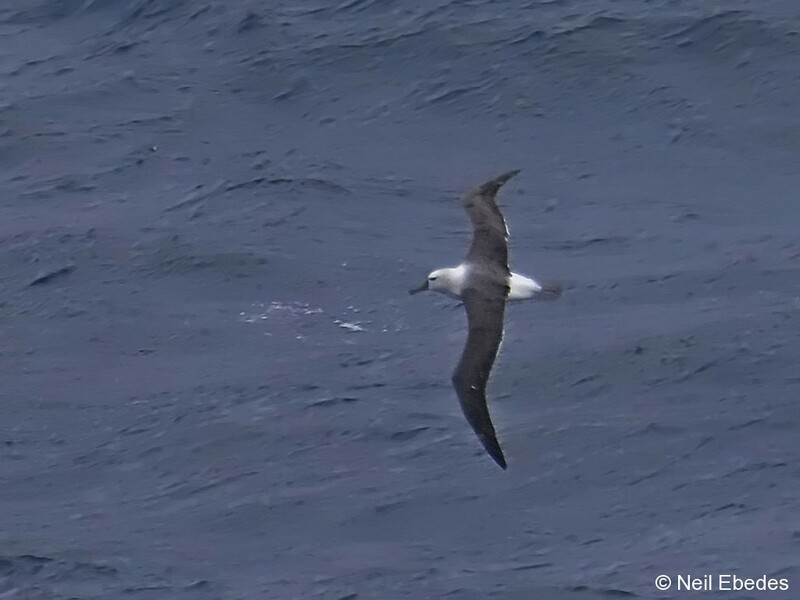 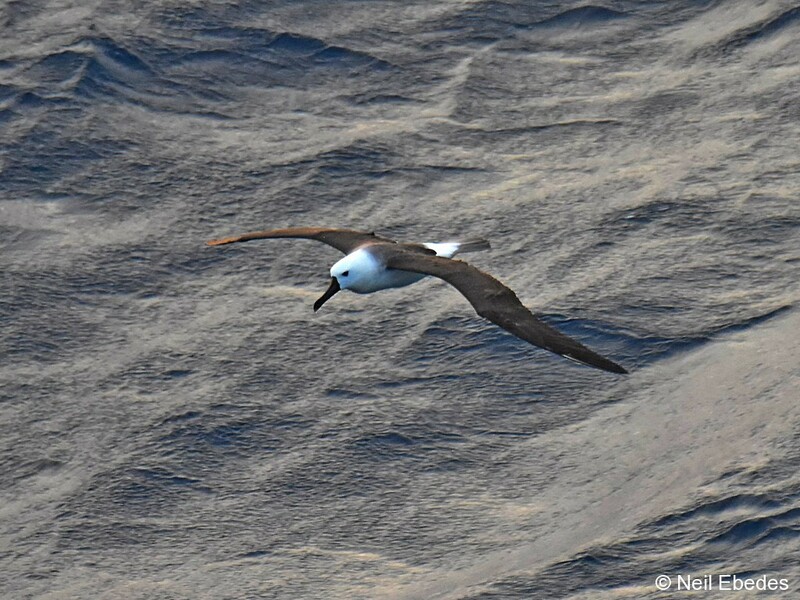 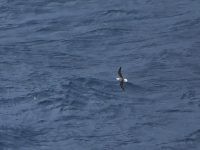 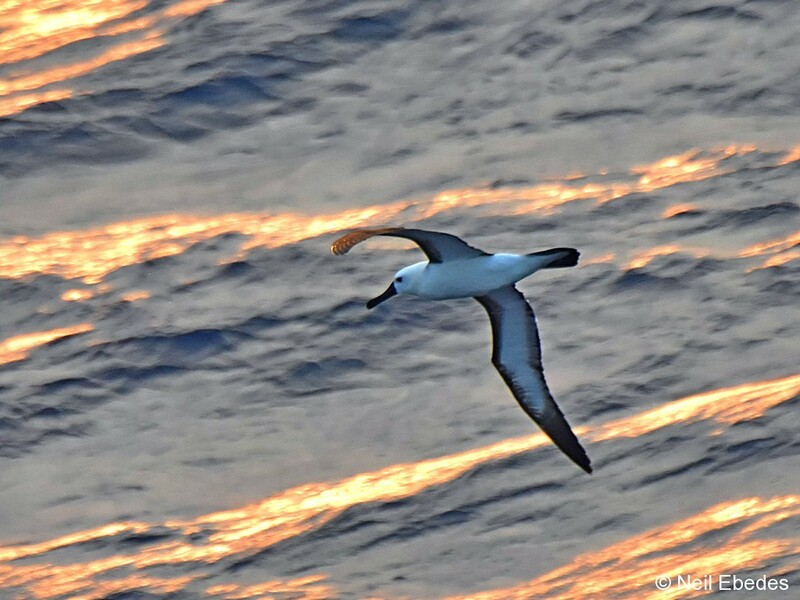 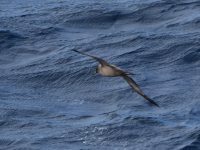 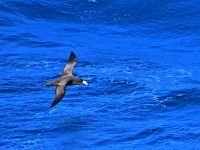 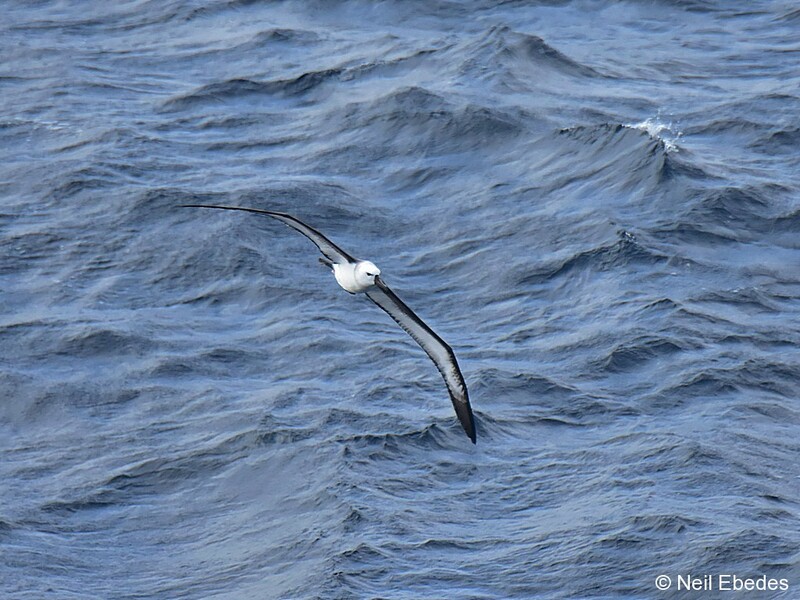 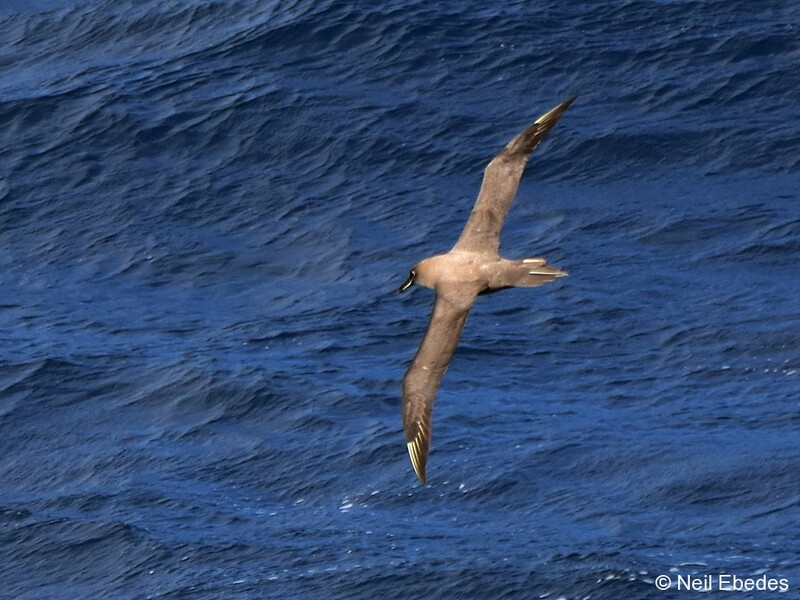 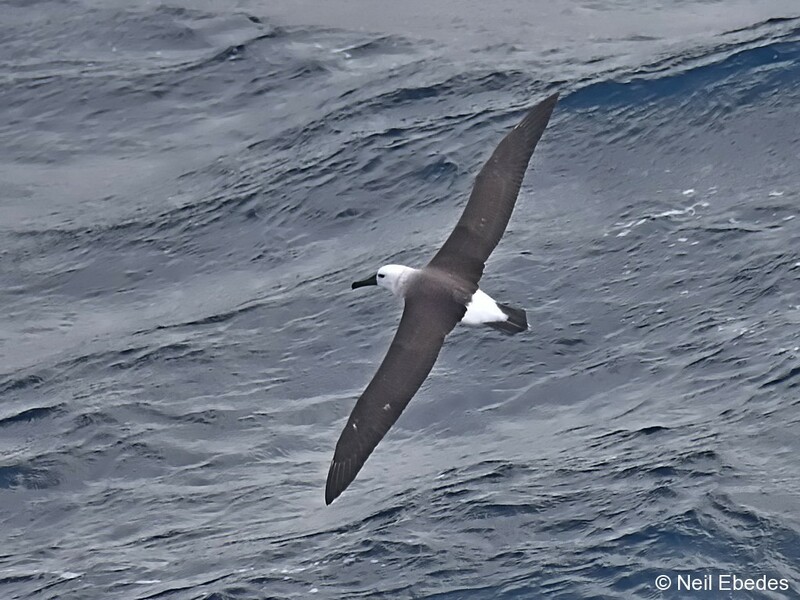 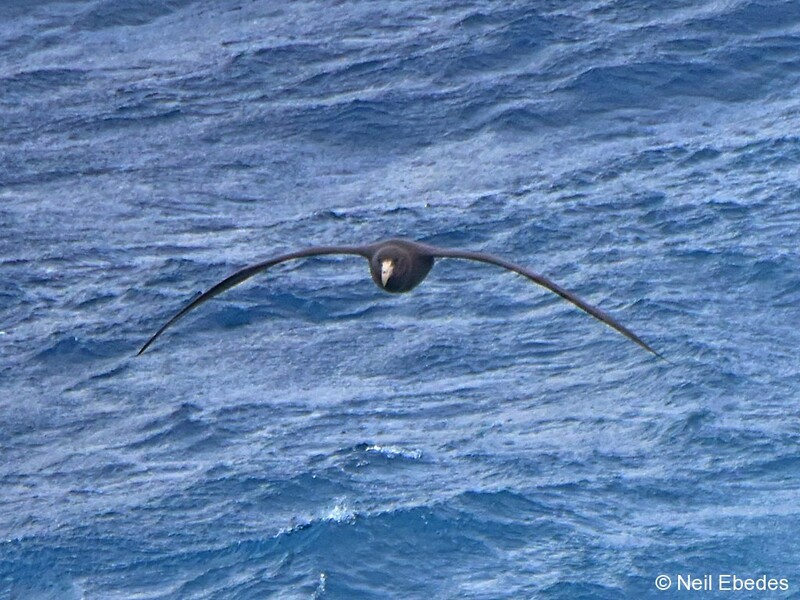 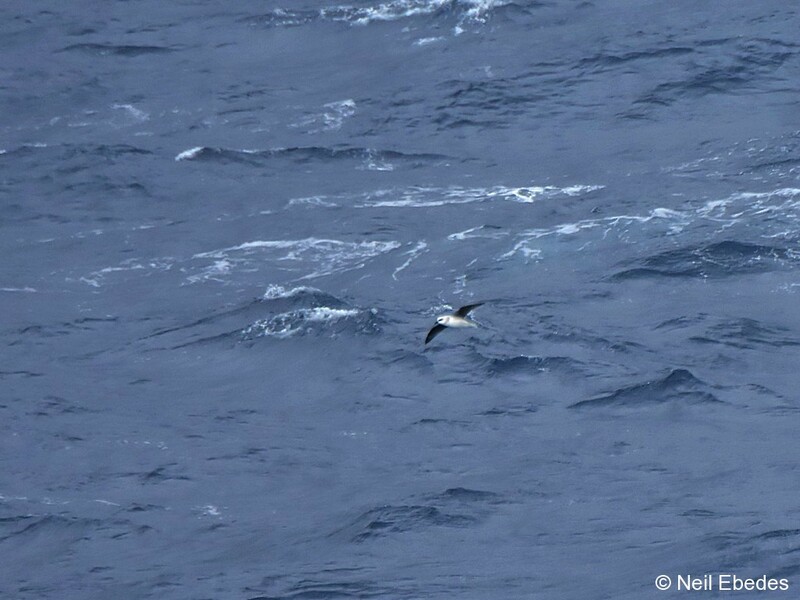 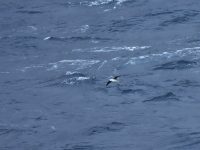 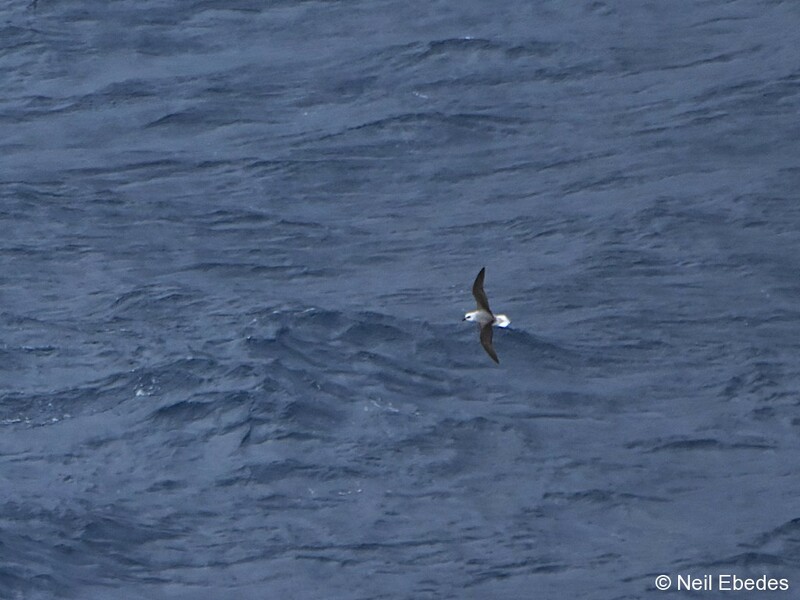 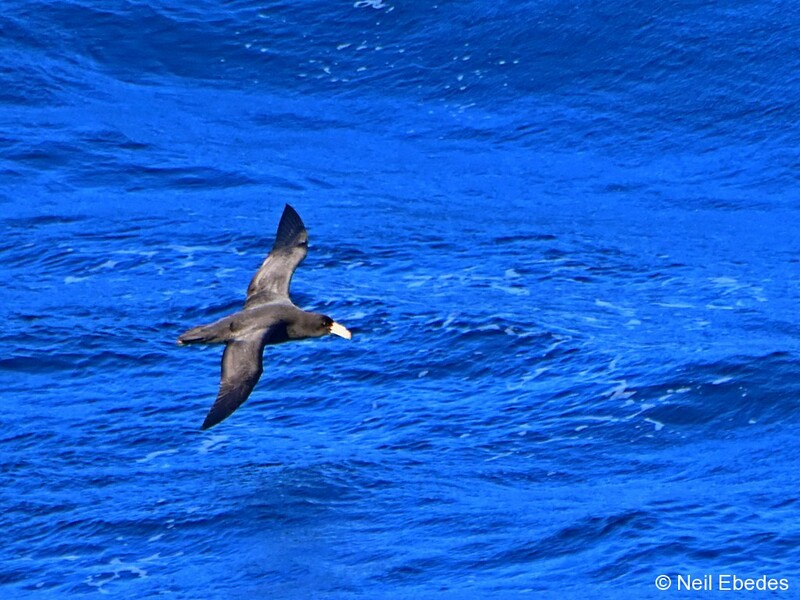 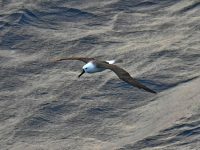 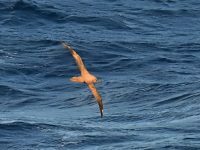 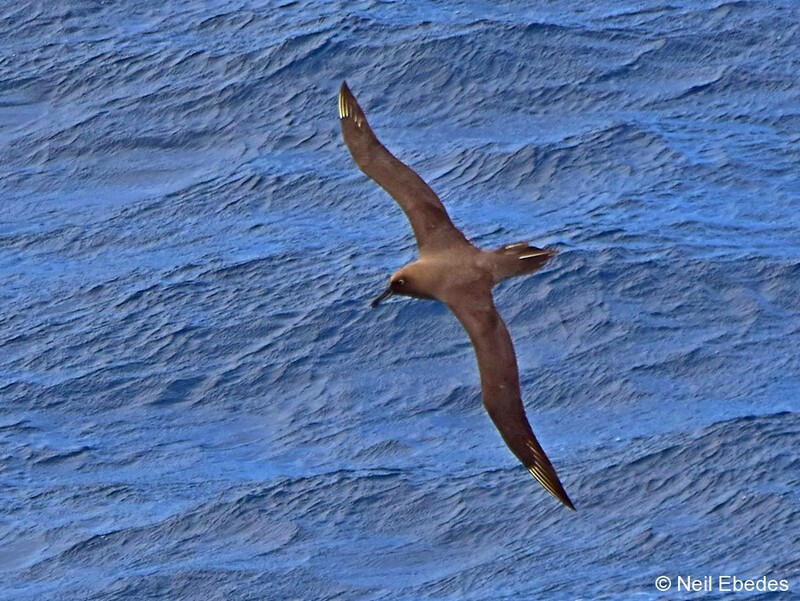 The IUCN ranks the sooty albatross as endangered with an occurrence range of 40,800,000 km2 (15,800,000 sq mi) and a breeding range of 1,900 km2 (730 sq mi). A 1998 estimate placed the population at 42,000 adult birds. 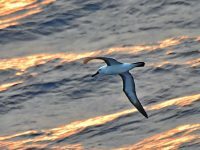 Populations have shrunk 75% over the last 90 years, although the rate of reduction has recently slowed. 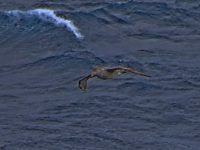 The 21st century has so far seen stable populations at Gough Island. 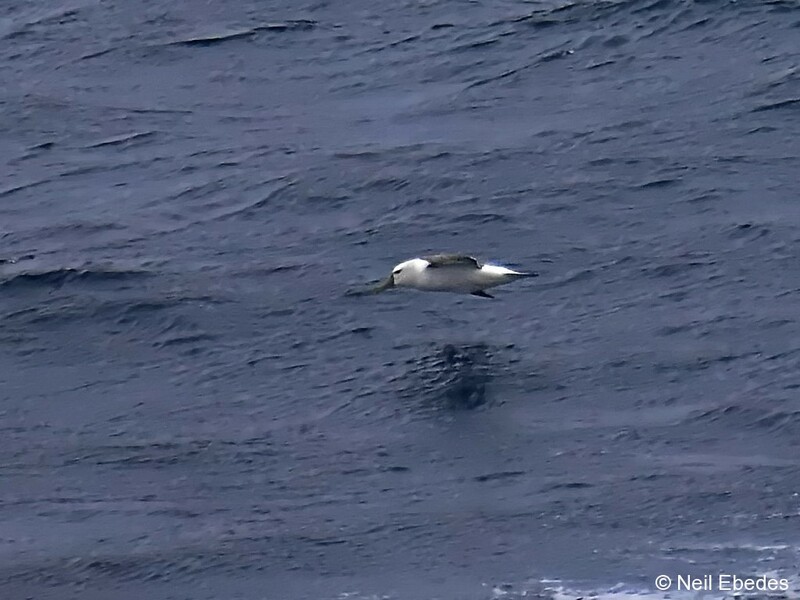 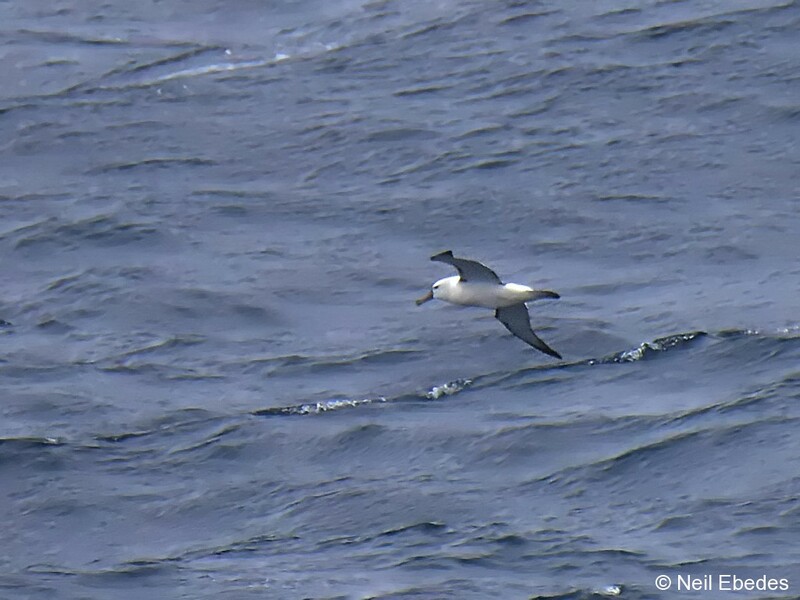 This species is not excessively affected by longline fisheries, but instead by domestic cats eating eggs and chicks on Amsterdam Island and the Kerguelen Islands. 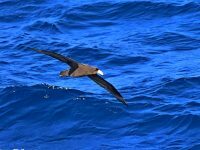 Avian cholera, pasteurellosis, and erysipelas are major threats. 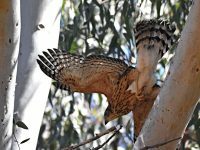 Illegal poaching has nearly ceased. 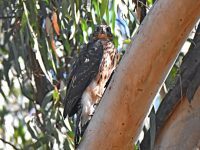 Studies and surveys are conducted to assist in slowing its demise. 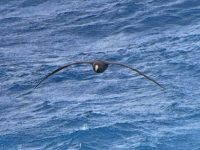 It is a protected species on the Tristan da Cunha group, Gough Island is a World Heritage Site, and Prince Edward Island, Gough Island, and Inaccessible Island in the Tristan da Cunha group are protected nature preserves. 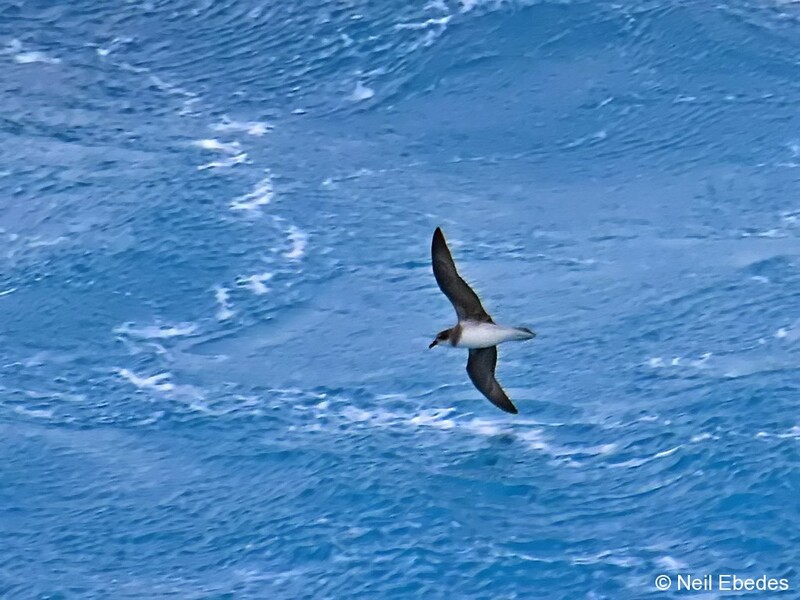 Also, in 2007, the Crozet Islands, Amsterdam Island, and the Kerguelen Islands were declared nature preserves. 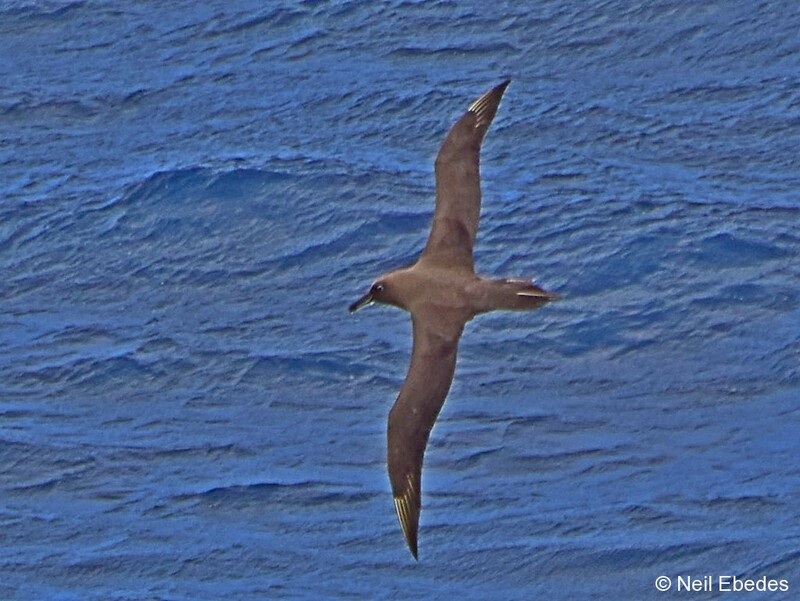 Like all albatrosses, the Indian yellow-nosed albatross is a colonial breeder. 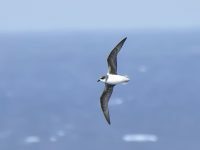 It breeds annually, and the adults begin breeding at the age of eight years. 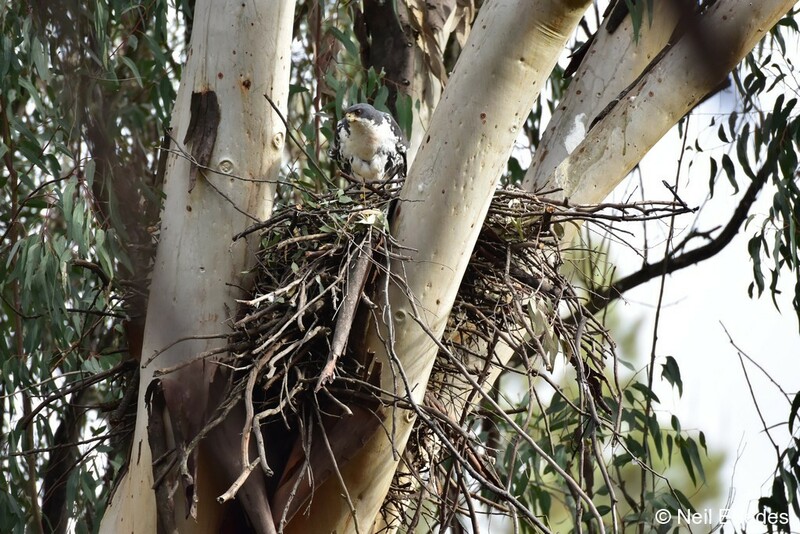 A mud nest is built in bare rocky areas or in tussock grass or ferns, and a single egg is laid. the nesting season begins in August, with laying occurring around September/October. 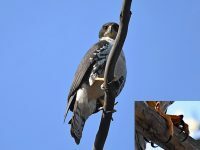 Incubation lasts around 70 days. 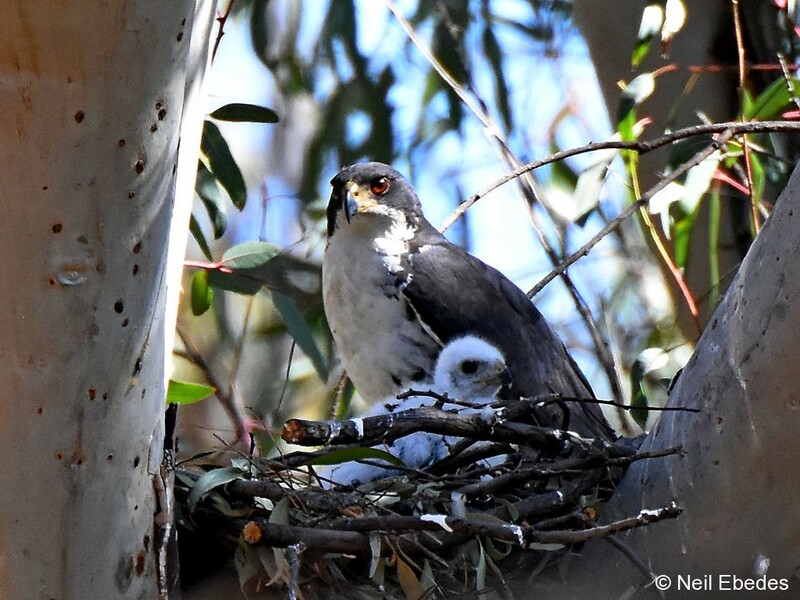 After hatching the chick takes around 115 days to fledge. 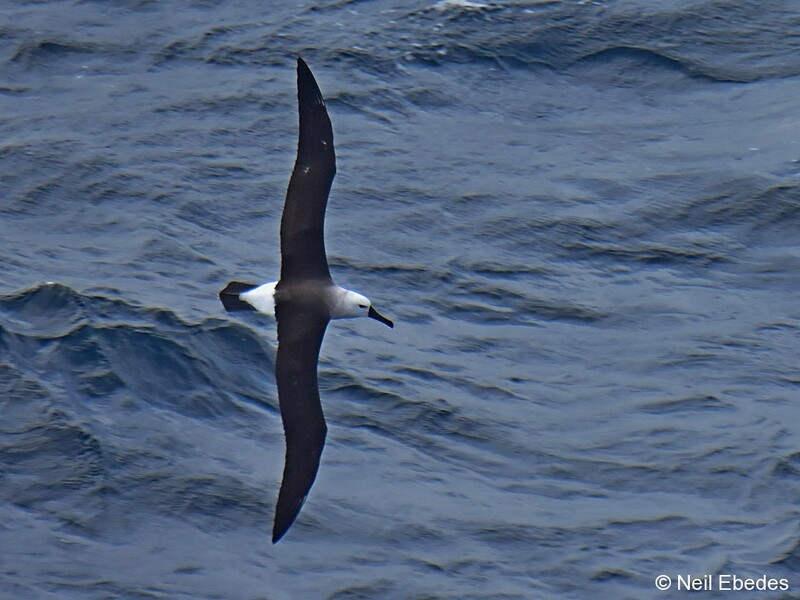 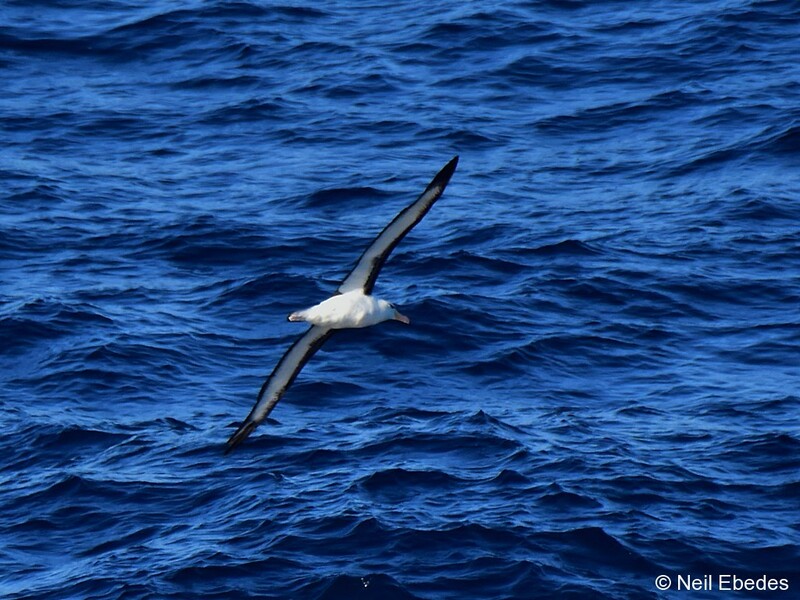 They have nasal passages that attach to the upper bill called naricorns, although the nostrils on the albatross are on the sides of the bill. 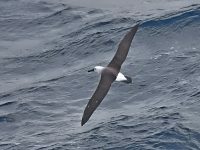 The bills of Procellariiformes are also unique in that they are split into between seven and nine horny plates. 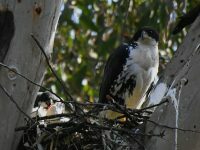 They produce a stomach oil made up of wax esters and triglycerides that is stored in the proventriculus. This is used against predators as well as being an energy-rich food source for chicks and also for the adults during their long flights. 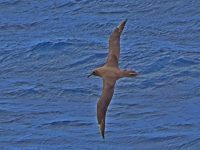 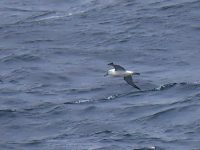 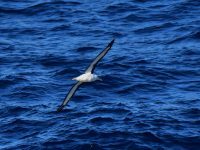 The albatross also has a salt gland above the nasal passage which helps to remove salt from the ocean water that they imbibe. 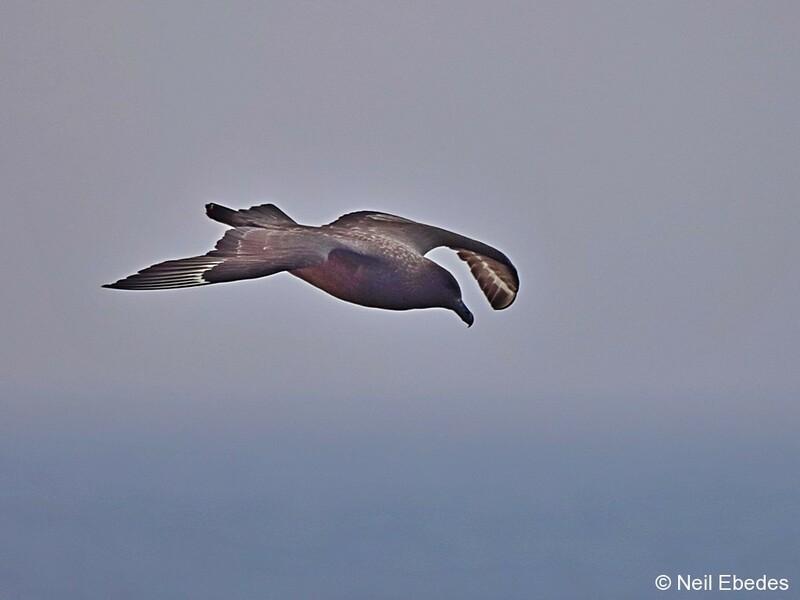 The gland excretes a high saline solution through the bird’s nose. 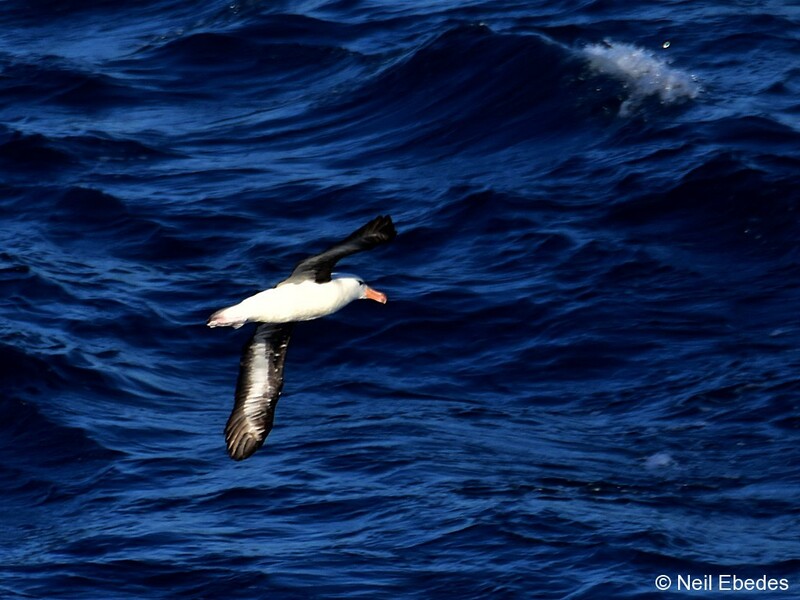 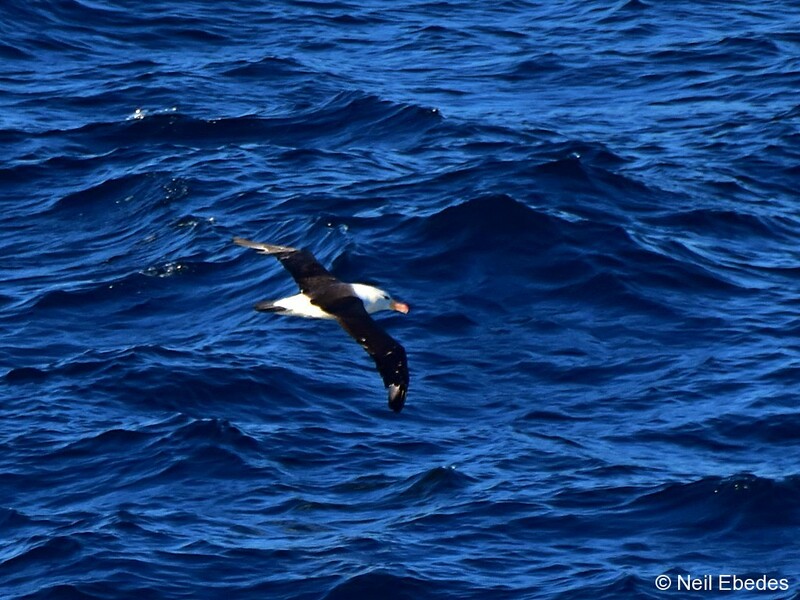 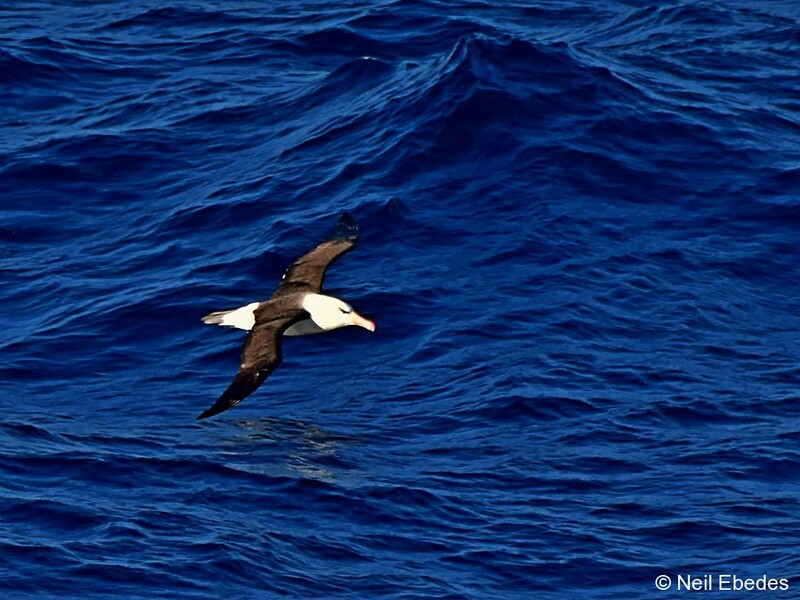 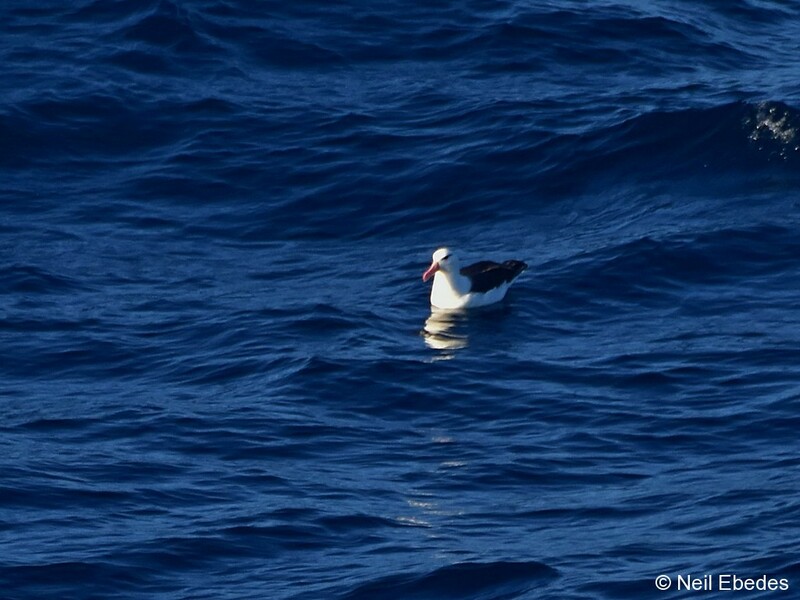 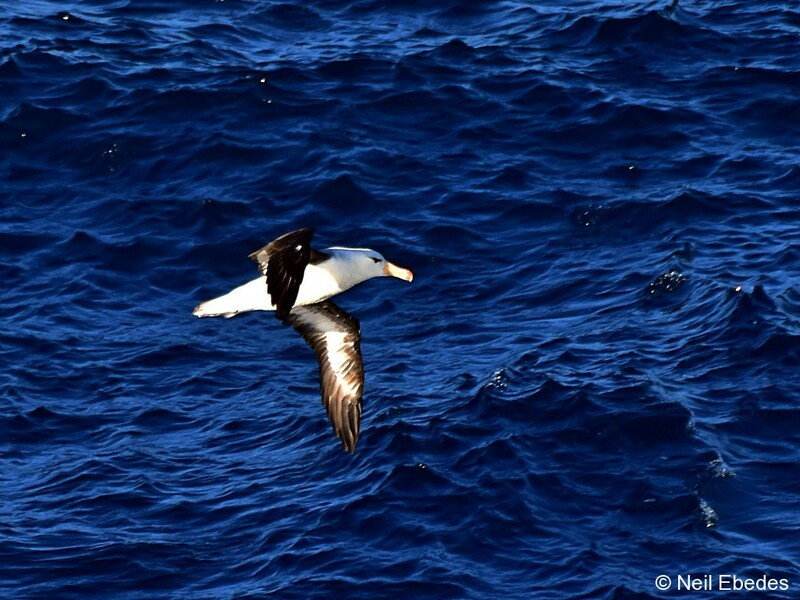 The black-browed albatross is circumpolar in the southern oceans, and it breeds on 12 islands throughout that range. 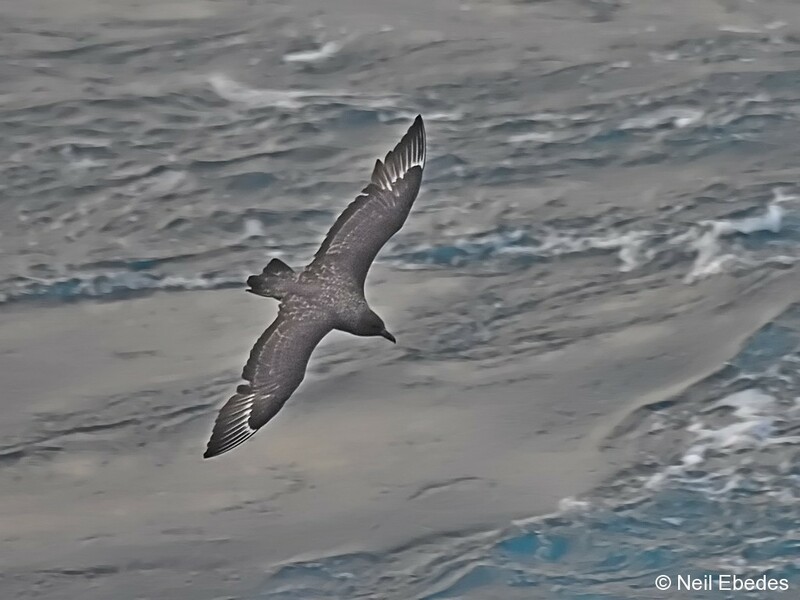 In the Atlantic Ocean, it breeds on the Falklands, Islas Diego Ramírez, and South Georgia and the South Sandwich Islands. 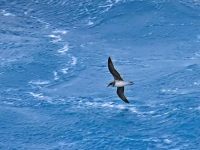 In the Pacific Ocean it breeds on Islas Ildefonso, Diego De Almagro, Islas Evangelistas, Campbell Island, Antipodes Islands, Snares Islands, and Macquarie Island. 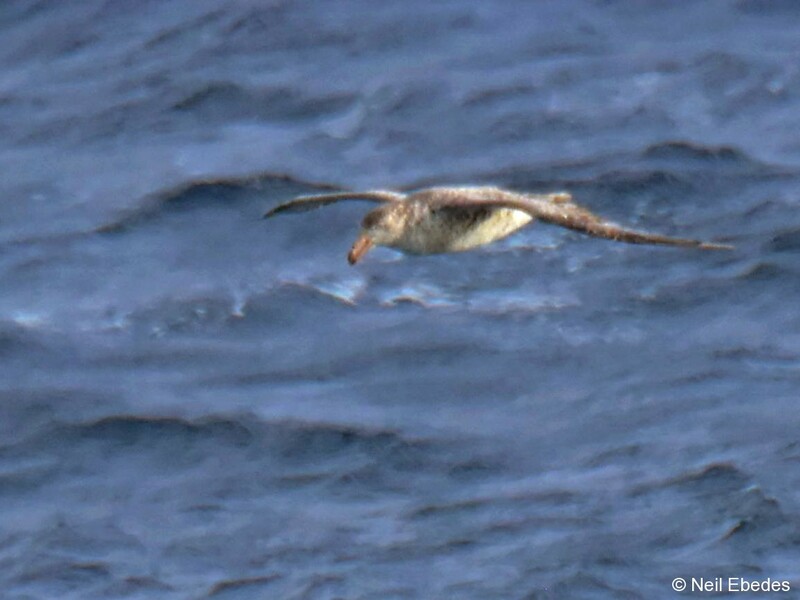 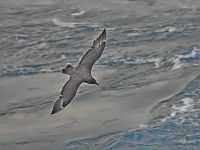 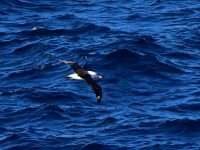 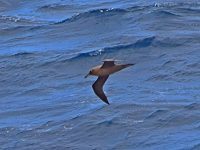 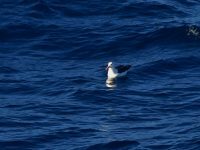 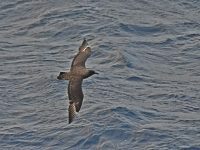 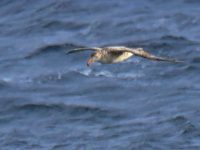 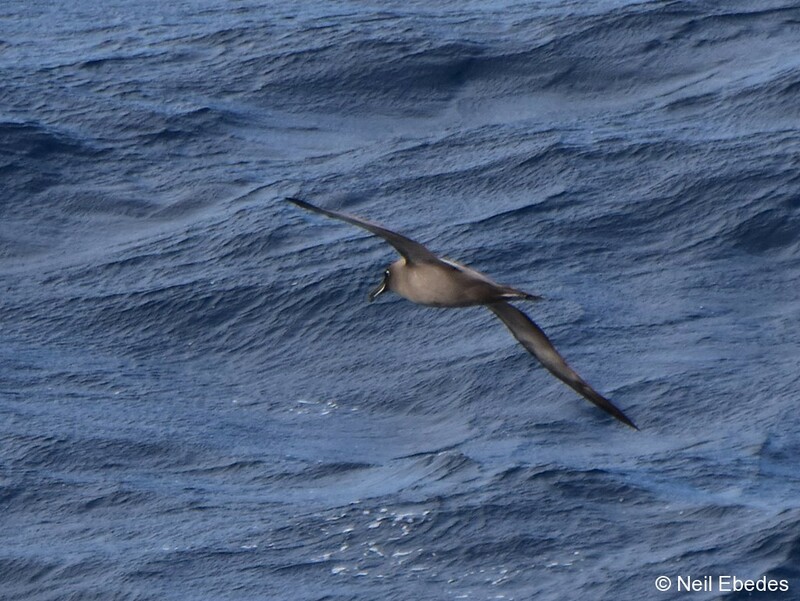 Finally in the Indian Ocean it breeds on the Crozet Islands, Kerguelen Islands, Heard Island, and McDonald Island. 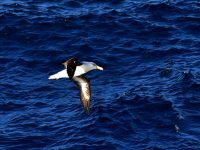 The native Tasmanian sea bird is currently listed as vulnerable under the Threatened Species Protection Act. 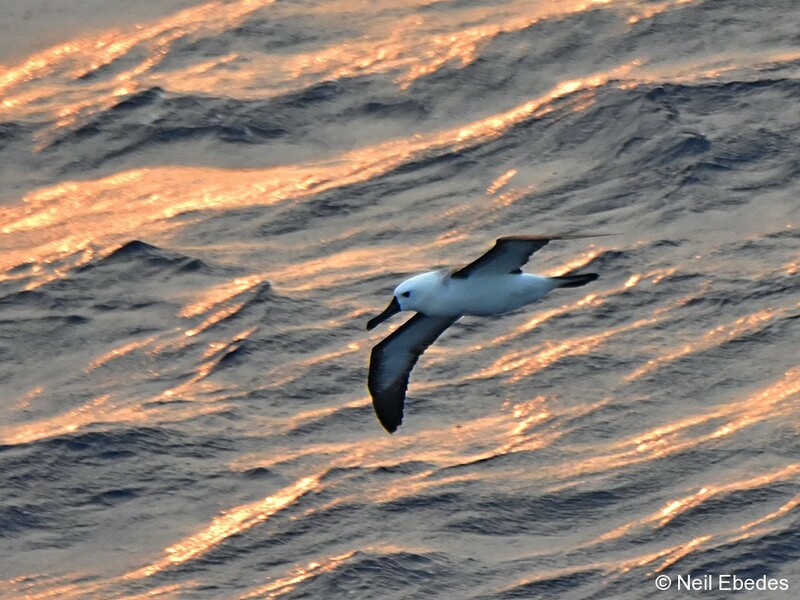 This is why a prominent scientist wants Tasmanian’s to get to know the shy albatross better. 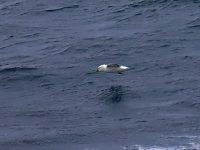 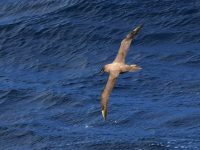 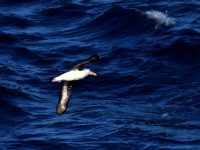 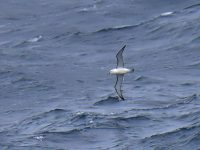 Spreading awareness of Tasmania’s vulnerable species , the shy albatross, is the key to keeping the species alive, a prominent scientist says. 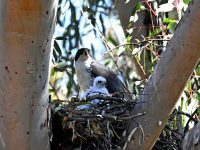 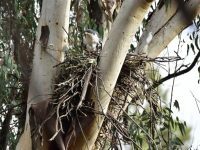 “There’s been a general decline in breeding success, for every pair that lays an egg it’s getting increasingly less likely that they’ll have a surviving chick at the end of the year,” she said.